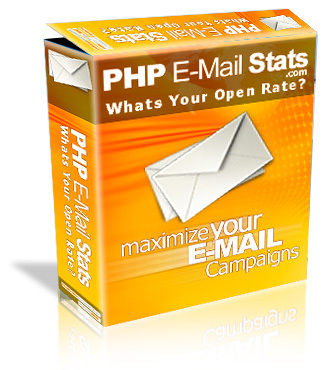 PHPEmailStats.com - PHP Email Statistics Script / Software giving you full control over your email campaigns! An Extremely Easy To Use Interface - You don't have to be a computer genius to use our system. If you can point, click, and paste you have what it takes to use this system. Detailed Reports To Drive eMail Response Rates - Now you have the ability to control your response so that you can squeeze the maximum amount of cash from each of your mailings. You will see exactly which e-mails got the best results and why! Simple Copy & Paste Integration - It just takes a couple of seconds to setup an eMail tracking campaign and after that you just copy and paste the code the system gives you right into your page. Nothing could be easier! In Depth "By User" Reports - With a single click you can see an entire list of the people who opened your e-mails or clicked on a link by name or e-mail address. You can then follow-up with these customers who already showed interest once! 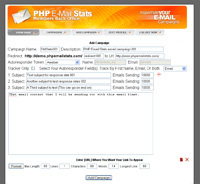 Setup An Campaign In Just Seconds - eMail Stats was designed to be extremely easy to use. After all, if you can't figure out how to use a system, it's worthless right? 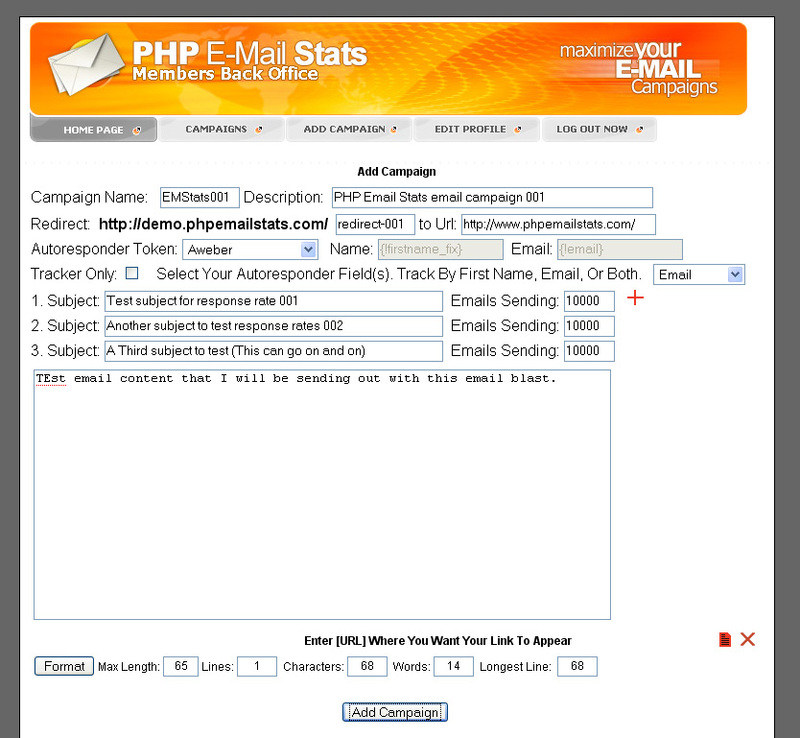 With eMail Stats you'll be up and tracking your first eMail campaign in just minutes! Secure "Steel Trap" Members Area - Using the latest in data encryption and security technologies you're data will be guarded with the fierceness of a pit bull. All of your important and vital information is safe, secure and protected at all times. 3 Deadly eMail Marketing Killers!" Read on for details on how to Super Charge your email marketing efforts, and finally be able to test and track your email to see what really works! Chances are that you are here because your e-mail isn't as profitable as it once was. You see, e-mail marketing is in an extreme state of distress and marketers all over the world are seeing their once great incomes disappearing right before their very eyes because their once profitable email list just isn't responsive anymore. There are a whole barrage of "virtual bouncers" that we have to get our messages through these days and as time passes, it's becoming nearly impossible to get the attention of our targeted audience through e-mail due to the market being flooded with new so called marketing Guru's every day. You could be losing out on 90% of the income your eMail marketing efforts should be generating if your messages aren't being delivered as you intended. Your email marketing income as you know it could totally cease to exist during the next 12 months if you do not take extreme, and fast action now! Do you know what is preventing your eMail from being delivered and or opened and read? There are dozens of reasons that your eMail might not be delivered. If you don't know about these then chances are they are hurting your response rates and even killing the majority of the income you should be making with each of your mailings. 1) Malicious Spam Complaints - Many people sign up for your list and forget that they signed up for your list and when they receive an e-mail from you, they report it as Spam. You can defend yourself with signup proof from your mailing software but in most cases, it still tarnishes your mailing record even if you are right. Read on to learn how eMail-Stats can help you clean your list everytime you send an email, and make your list more responsive in very little time. 2) Spam Filters - Spam filters are filters that can be setup to monitor e-mail and trash any e-mail from pre-defined recipients or e-mails that contain certain words. If you end up being filtered as Spam, your message will never been seen and may end up reported to a blacklist. 3) The eMail Block Button - Many people who signup for your list and either forget or just don't want to get your e-mails anymore will just block you. This is logged with the ISP they get their e-mail through and yet another mark goes against your e-mail deliverability that you don't even know about. You could have a list of 5,000 subscribers but if 1,000 have blocked you, you are paying to mail prospects that will never see your message, and hurting your deliver rates to the other 4000 at the same time. All of these are hard, if not impossible to combat. 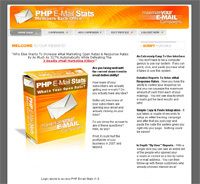 eMail-Stats will help you clean these types of subscribers off your list all while helping you test many aspects of your email marketing campaigns. This will allow you higher profits per each mailing you send and increased deliverability rates by leaps and bounds. Could You Be Slowly Losing Your Business & Your Hard Earned Respect? With the current state of e-mail, e-mail marketers are in a pretty big bind and no one really knows what to do to remedy the situation. The sad thing about this is that many of the marketers out there are trying to remedy their lower email conversion and income rates by mailing their list more often which is just resulting in more Spam complaints, more negative filters, more e-mail blocks, and even lower yet conversion response rates. I can understand their rationale behind this decision; "My list isn't as profitable per mailing so I'll just mail them more to compensate". While this may work at first, this is certain death for any marketer that uses email to sell products. Eventually most of the people who actually do open your e-mail will unsubscribe, block you, or report you as a Spammer and you'll have a list that doesn't produce a single sale no matter how much you mail it. Not to mention you will also be on so many block lists that any chance of recovery will be lost. It's true, the click through rate that you used to get from an e-mail to your list is likely less than 10% of what it used to be only a year ago! The truth is, many of my big Internet marketing friends who have been doing business online for many years used to generate several thousand clicks from their e-mail lists just from one e-mail and now they are lucky to generate a couple of hundred clicks and make a few sales. Losing 90% of your business is a pretty hard pill to swallow. Dozens upon dozens of businesses have folded and will never return because of their inability to get e-mail promotions to be profitable. In spite of all of these huge holes you can fall into with your e-mail promotions, in spite of all the businesses dropping like flies, my e-mail is still super successful. I track everything that my subscribers do so I know what e-mail is getting delivered, what e-mail is getting opened, what links are getting clicked and exact response rates to all of these numbers. I can take a glance and see things about my e-mail that other marketers have never even imagined being able to track or analyze. If this was around before e-mail started going down hill, there might still be several hundred businesses around that didn't crash and burn from their dead e-mail efforts. I know, you're probably thinking "track e-mail?" It's a weird concept and I have to tell you that when I convinced the person I met to design this technology he didn't have a clue how he was going to go about doing it. Do you now what the difference between a campaign that does $1,143 and one that does $11,430? Here's how a test with this system will increase the money you make selling a $27 product. Instead of mailing to the whole list blindly, we will mail to four groups of 1,000 subscribers, with four different subject lines and see how they do getting our e-mail opened! Now to even illustrate how you can increase profit even more, we will test the sales ratio of long eMail copy versus short eMail copy. Now that we know the most responsive subject line and the most responsive form of copy, we can roll out our eMail to the rest of our list; the 44,000 remaining subscribers. If these numbers aren't profound and eye opening, I don't know what is. Looks at the numbers, they don't lie. Just by testing, you took a potential sales number of $432 and improved it to well over $8,000 in sales. That's almost 20 times more money just because you took a few minutes to test! The great thing is you don't have to do any of these calculations or any of the complicated stuff that goes with these tests now that you have discovered my new Email Stats! In no time flat you will be armed with all the information you could ever need to double or even triple the conversion rates of all of your email marketing campaigns. We will collect the information for you that is going to become vital to understanding exactly what makes any of your email campaign's a success or a total flop. You will be creating profitable e-mail campaign after profitable e-mail campaign almost effortlessly just by letting this awesome tool uncover the hidden secrets in your list. This Information Is Extremely Vital With Today's Hard Pressing Problem Of Getting eMail Delivered, Opened And Responded To! If you take the time to give these customers that little bit of extra attention, do you think they may tell others about you? Do you think they may become a customer for life? Take the time to treat your special customers right, and I assure you they will be there snapping up offer after offer that you put in front of them. How would you feel if a top Internet marketing "Guru" took out the time to snail mail you a thank you note, or what if he even took it a step further and out of the blue gave you a call on the telephone to make sure you were happy with his "X, Y and, Z products that you owned. You would be impressed wouldn't you! I know I sure would. And that kind of service would keep you buying again and again. Now we all know that there's no way we have time to call every customer on the phone, but if you know which customers were extra special we may have the time to let them know, right? And guess what! They will tell everyone they know... and now all their friends and customers will become your customers as well. Can you see how powerful this e-mail tracking information can be? Can you see your sales doubling or even tripling almost overnight? It's Easy To Create Responsive & Profitable eMail Campaigns! eMail Stats will provide you with extremely scientific data that you could never get otherwise. The best part is that it's extremely easy use. So easy in fact that my 10 year old nephew could do it. 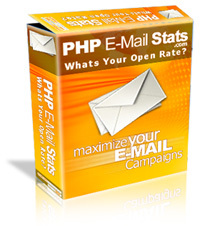 You're going to be tickled to death at the sheer ease of use with the eMail Stats system. We firmly believe that you will never find an easier, more user friendly system anywhere online. What Insider Information Will You Get From This Tool? Exactly How Many People Are Opening Your Messages Every Time You Mail! Which Actual Subscribers Opened Your E-Mails So You Know Who Is Responsive! How Many People Clicked On Your Ad To See How Effective It Was! Which Subscribers Clicked On Your Link With First And Last Name Identified! Detailed Reports That Analyze & Show You What's Working And What Isn't! You'll Know The Exact Offers Your List Likes & Why So You Can Make More Money! Are You Ready To Join The Top 1% In eMail Profitability? We both know that you need this system. The current state of e-mail marketing is not in good shape and the truth is there just aren't many tools out there to combat this. But do you really want to? Or can you afford a full time employee for that? If you answer no to either of those questions today is a breakthrough day for you because you are going to get access to this complete system for putting your e-mail profits on over drive just a minute from now. While I could charge upwards of a thousand dollars or more to share this system with the public, I'm not going to do that. As you've seen in my awesome sales in the past, I always offer incredible products at an even more incredible price and today is no different. But there is one caveat...I am only opening this up to 300 people because I want to test it's effect on the profits of the e-mail marketing efforts for this small group and then I will decide if want anyone else getting their hands on it. So if you act today and all 300 slots aren't full yet, you can get a copy for the insane price of just $147. Remember, my ArticleWholesaler.com site has been full for a year with only one promotion to fill it besides the initial launch so this tool will definitely be sold out just as quick. You Deserve In Your eMail Campaigns? I'm sure that you realize the incredible value and essential use of the eMail Stats System in your business. You need your eMail to be profitable and after just one use of the eMail Stats System it will be, guaranteed! Aren't you tired of getting less than stellar results with your e-mail campaigns? Wouldn't you like to make a killing with every e-mail you send? Don't you deserve the right to take back the profits that you've been missing with your e-mail marketing? eMail Stats can be had for the cost of a night on the town and after you use it you'll be able to have as many "nights on the town" as you want! Full source code, PHP , MySQL and Apache Complete Website Script. By completing your payment, you agree that you have read and understand our short, and simple software terms here. Immediate Download Access! We will send an email to the paypal email address with your login details for the download. Instant download access via paypal checkout. We both know that you could be making much more with your eMail. Will you be one of the few that take action and increase their eMail profits automatically? Don't delay because once these 300 slots are full, the doors are closed and there is nothing I can do to get you inside. Click the easy order button above for instant access.